“Transit first” is one of the priorities set out in Philadelphia’s new transportation plan. Philadelphia released a transportation plan Wednesday that outlines the city's goals for street safety and transportation for the next seven years. Much of the report updates projects or initiatives already underway. Vision Zero, the city's strategy to reduce traffic-related deaths, is prominent, with promises of $150 million in infrastructure projects throughout the city by 2025, as well as a statement for the first time that the city wants permission from the Pennsylvania legislature to install speed cameras near schools. 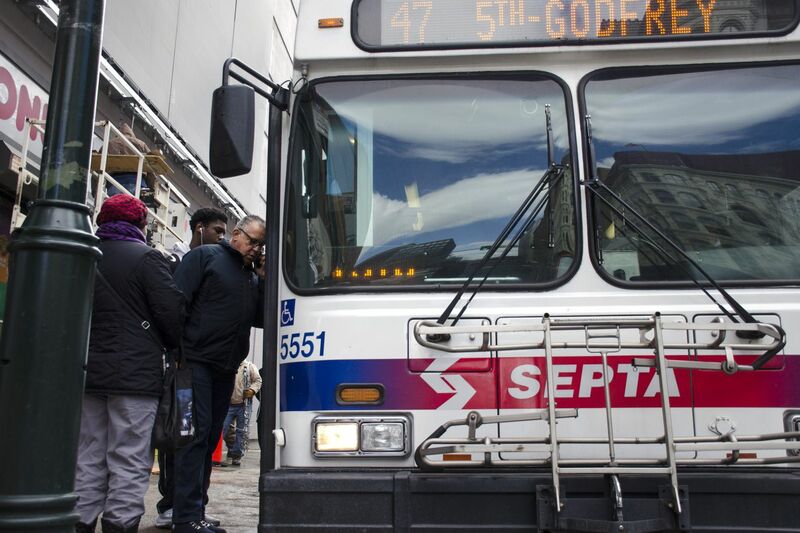 The report emphasizes the city's increased investment in public transportation by highlighting SEPTA's plans to redesign the bus network and invest in new trolley cars. And it touches on the city's intention to improve the quality of streets, with a promise of paving 131 miles each year, a significant improvement from the current rate 80 to 90 miles a year. Amid the details, a few interesting themes and policy changes stand out. Here are five key points. Mayor Kenney once resolved to create 30 miles of protected bike lanes during his administration. That's been hard to accomplish, and the city has created only about three miles of protected bike lanes since the mayor's election. Ambitions have been scaled back, said city officials discussing the report ahead of its release. The new goal is 20 miles by 2020 and 40 by 2025. The report contains a number of proposals to manage increasing traffic in Center City. The city plans to change the way trucks are allowed to use streets, with the goal of restricting big-truck traffic on some streets, changing parking regulations to create more unloading spaces, and providing areas for truckers who live in the city or are here overnight to park their rigs. The city is considering varying the cost of parking in commercial corridors depending on the time of day and, to encourage turnover, limiting the amount of time a vehicle can remain in a particular spot. The city's street grid as it is, however, might not allow for huge improvements in traffic. "Holding the line on congestion due to automobiles," said Mike Carroll, the city's deputy managing director for the renamed Office of Transportation, Infrastructure, and Sustainability (OTIS), "that will constitute a success if we can experience the economic growth we're looking for." "We're prioritizing the movement of people by transit in Philadelphia," said Chris Puchalsky, OTIS's director of policy and strategic initiatives. Getting Philadelphians on buses, trains, and trolleys is a major priority. It relieves congestion, creates mobility for the city's poor, and benefits the environment. The city is all-in on SEPTA's bus route redesign and is seeking to create a city transit plan, something Philadelphia has not had since the 1960s. The city also expects to take a more active part in influencing ride-share legislation. That industry is regulated by Harrisburg, but city officials have expressed concern about how Uber and Lyft hurt bus ridership and increase the number of cars on the road. The law that made Uber and Lyft legal in Philadelphia is up for renewal next year, and the city expects to be involved in requests for changes. Among the issues city officials will raise are pay for drivers, vehicle safety, and the fees associated with operating a ride-share company in the city. SEPTA is facing a potentially significant financial crunch in 2022, when the Pennsylvania Turnpike Commission's annual payment of $450 million to PennDot — money that SEPTA benefits from — will drop to $50 million a year. To get people to prioritize public transportation, the city needs SEPTA to be well-funded, officials said. The city plans to explore increasing regional funding. Now, the region provides about 11 percent of SEPTA's money, less than the regional contribution in comparably sized cities. City officials say they will lobby suburban counties to create a more robust regional financial base for SEPTA. Philadelphia isn't a city with civic organizations that rally around transportation issues. The Bicycle Coalition of Greater Philadelphia has had great success in making street safety a priority for government, but other organizations have not shown such full-throated activism on the subject. The report sets creating community coalitions a priority, with the goals of hiring an outreach staffer by the end of 2020 and holding transportation summits in the coming years.